According to a Penn State alternative student blog, Onward State, Director of Greek Life, Dr. Roy Baker, Director of the Paul Robeson Cultural Center, Carlos Wiley, and the leadership of Chi Omega met to discuss potential punishments for the sorority last night. Suspension is rumored but not confirmed. 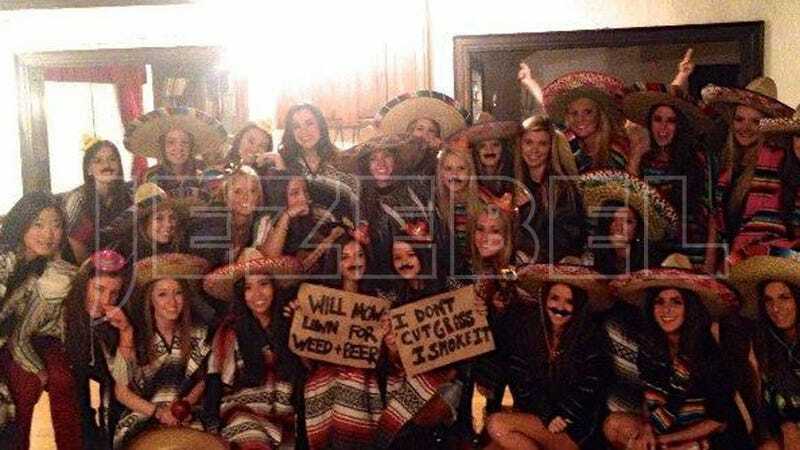 "The Mexican American Student Association is disappointed in the attire chosen by this sorority. It in no way represents our culture. Not only have they chosen to stereotype our culture with serapes and sombreros, but the insinuation about drug usage makes this image more offensive. Our country is plagued by a drug war that has led to the death of an estimated 50,000 people, which is nothing to be joked about." Sorry to rain on your Skinny Girl Margarita parade, ladies.